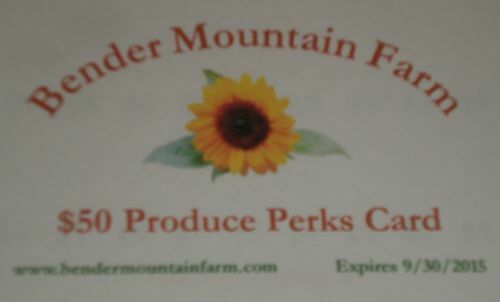 The $50 Bender Mountain Farm Produce Perks Card is now available for 2019! This card is only for customers who plan to shop with us at the Tanana Valley Farmer's Market. ~First, you save 10%! The cost of our Produce Perks Card is only $45.00! ~You will receive weekly emails through the summer letting you know what we have for sale and when we'll be at the Farmer's Market. ~Finally, you help the farm by offering your support of locally grown produce early in the growing season which helps ease our yearly start up expenses.